Though I was leaving it a little late, the last week of March was a good time to tackle the month's calendar recipe. It made good use of a fresh vegetable delivery, especially a big bunch of spinach and some assorted other greens. We increasingly fall back on fritters to use up vege scraps, but I never think to combine them with ricotta as in this recipe here. I took the trouble to buy the proper stuff from a deli instead of a watery tub from the supermarket (and kept half of it aside for an upcoming recipe). I wasn't sure that it'd matter, all mixed up with flour and spinach and sun-dried tomatoes, but the quality ricotta really shone through. Not only did I eat the fritters bare of chutney, but I left the side salad undressed and wasn't left wanting for flavour or richness. Bring a large pot of water to the boil and blanch the spinach for 30 seconds. Drain it and refresh with cool water. Squeeze out as much water as you can and finely chop the spinach. In a medium-large bowl, whisk together the milk, eggs and ricotta. Stir in the flour and baking powder until well mixed. Fold in the spinach, semi-dried tomatoes, basil, salt and pepper. Bring a frypan to medium-high heat and spray it with oil. Spoon about one-sixth of the batter at a time into the frypan, smoothing it out a little. Allow the fritters to cook for a few minutes on each side, until golden and cooked through. Serve three fritters per person with mixed greens and grape tomatoes on the side. In The Smitten Kitchen Cookbook, Deb Perelman confesses that she formulated seven muffin recipes before finally submitting this one. I wasn't quite sure what would mark a particular muffin as the best of seven but I was willing to find out, and pack the proceeds on a work-sanctioned road trip to north-western Victoria. I guess it starts with an attention to detail that I don't quite have - two kinds of sugar, two kinds of flour, two kinds of fat, two kinds of flavouring. And one of those fats is browned butter, quite a stretch from the vegetable oil in so many other muffins. I'm not an experienced butter browner, and I kept a pretty close eye on mine, but still somehow panicked that I might have burnt it beyond use. Thankfully essjayeff was on hand twitterwise to encourage me onwards. After a few minutes cooling, my butter smelled a little like caramel and it did ultimately add a nice depth to the colour and flavour of these muffins. The other thing going on here is fruit - lots and lots of fruit. This muffin batter is little more than a binder for a bag of plums. I really pushed it to the limit, erring upwards in my plum weighing and then omitting the fruit from two of the twelve muffins (due to allergy concerns). I just barely got away with it - my muffins did set through and have remained just on the pleasant side of soggy even a few days later. In the end, I'm almost impressed that Perelman took a mere seven attempts to strike so close to muffin perfection. Preheat an oven to 180°C and grease a muffin tray. In a small saucepan over medium heat, melt the butter. Swish it around occasionally and keep cooking it until it starts to brown. Take it off the heat and set it aside to cool. In a large bowl, whisk together the egg and sugars. Stir in the browned butter and yoghurt. In a smaller bowl, sift together the flours, baking powder and soda, salt, cinnamon and nutmeg. Stir in the poppy seeds. Pour these dry ingredients into the larger bowl of wet ingredients, stirring them together until just combined (a few lumps are OK). Fold in the diced plums. Spoon the batter into the muffin tray to make 12 muffins. Bake them for 15-18 minutes, until golden and cooked through (use the skewer test). Let the muffins sit in the tray for a couple of minutes before gently transferring them to a rack. Michael made a cursory search for nearby cafes that might serve us breakfast on Monday morning and up popped Vintage Espresso at Mermaid Beach. On sight, I could barely believe it: this cafe could have been airlifted and deposited directly from Melbourne's inner north. (More likely, my sense of south-east Queensland is seven years out of date and such cafes thrive all over Oz.) The interior is vintage through and through, from the furniture and wallpaper to the crockery and copious (but not cluttered) knick knacks. This much orange and brown usually strikes me as dowdy. Maybe it was the white walls, the good condition of their wares or the Gold Coast sun streaming in, but here it was positively cheerful. I was cheered, too, to see another cafe offering iced chai ($6.50). I am too optimistic. This one was the sweetest, least spicy version I've encountered yet. Peeps've really gotta sort out a way to inject some ginger and, I dunno, actual tea into these things. Michael's flat white offered more satisfaction. Glutton for punishment (and sugar), I backed it up with an order of banana bread ($5.50). This, I can recommend - thick and gently sweet, with a good measure of toasty walnuts. Michael ordered the Spring Harvest ($15), a procession of well poached eggs, roast tomato, mushrooms, polenta bake, spinach and pesto - all fresh and heartily enjoyed, including the tomato (!). Game for more, he followed up with a kale, apple, grape and cucumber juice ($6.50). There's plenty on offer for vegetarians at Vintage - additionally fruit, muesli, French toast, more eggs and avocado mashed with feta - but vegan options are less obvious. Gluten-free dishes aren't marked either but are relatively easy to identify. I liked that the toast menu extended beyond sourdough to fancy fruit, bagels and something pumpkin-based. The service was pleasant and the kitchen didn't leave us waiting too long. Vintage Espresso have clearly put as much care and skill into their food as their fit-out. There are positive blog posts about Vintage Espresso on your local markets, green been, Girl Who Does Lunch and Espresso Escapades, then a mixed one on Taking Care of Breakfast. Accessibility: The cafe is split level - tables out front, up a step and counter level and up a couple more steps to an elevated dining area. Tables are somewhat crowded inside. We ordered and paid at a medium-height counter, though food was served to our table. We didn't visit the toilets. A dear and distant friend's first solo art exhibition drew us from Brisbane to the Gold Coast, and we scheduled in some veg eating too. Reader Fiona first recommended Easy House to us in an email more than a year ago; Matt echoed her endorsement in a more recent message. Our timing didn't permit us to test out Easy House's yum cha but we did stop by for dinner. The menu runs to more than 80 dishes - fried entrees, soups, tofu, vegetables, lots of mock meats, hot pots, rice and noodle dishes. Many of them were familiar from other Chinese-style vegetarian menus, but we found a couple of novel dishes to order. The vegetarian roast goose ($14.80) was made primarily of layered bean curd skin, with a few finely chopped mushrooms and other vegetables tucked in between to boost the umami element. The curd was melt-in-the-mouth tender and perfectly contrasted with a crispy-battered shell. The accompanying sauce was more sweet than sour, but still welcome. We doubled down on deep-fry with the salt and pepper eel fillets ($16.80). These didn't deviate from the glutenous faux-fish I've eaten elsewhere but I wasn't disappointed - there's something almost electric about the seasoning that I can't imagine replicating at home. The Easy House atmosphere is a little stark, and more customers seemed interested in takeaway than eating in, but we received very helpful and timely service. The menu is extensive and the quality and price of the dishes we tried compares favourably with the Chinese-style mock meats we've eaten elsewhere. I hope we can cook up other reasons to visit again, ideally for yum cha next time. Easy House has already earned blog love on definatalie.com and Delicous Encounters. Accessibility: There's a small step up into the restaurant (see photo above) and tables inside are quite crowded. We ordered at the table and paid at a high counter. We didn't visit the toilets but I noticed another diner borrowing a key, presumably to access them elsewhere in the mall. Updated, 31/12/2014: The Banana Lounge didn't last long - Urbanspoon has it listed as permanently closed. Since my last visit to Queensland, James and Matt blogged a run-down of new veg*n hotspots on their radar, including The Banana Lounge. While spending the week in Brisbane for work, I squeezed in a lunchtime visit after a morning at GOMA's splendid APT7 exhibition. The Banana Lounge's exterior is a fairly dowdy brown brick building with a few telling yellow flags and stools. Stepping inside I was in familiar vegetarian cafe territory: decorations were cheery, abundant and haphazard; Cat Stevens controlled the stereo for the entire hour. The menu covers breakfast, lunch, drinks and cake; it's all vegan and gluten-free options are helpfully marked. Savoury cook-ups with mock meats and tofu scrambles are prominent, though of course my eye paused longer over the pancakes, muesli and raw crepes further down the page. Lunch covers the vege classics - a felafel plate, Indian curry plate, burrito and burgers, plus there's customisable sandwiches and sometimes pies in the warmer. To drink, there's the requisite selection of smoothies, juices, coconut water and organic soft drinks. I was tickled to see iced chai ($4.50) on another menu. This one scored points for not containing aerosol cream but again come across as little more than sweet milk with cinnamon powder. I can be soy-fussy but can't fault the milk and icecream used here. I was in a burger frame of mind and tried out their 'beef' one ($9.50). The primary ingredients were pretty standard stuff - soft roll, Fry's patty, tomato sauce and mayonnaise - but I appreciated their efforts with the salad. I could barely close my mouth around the burger thanks to the tomato and cucumber chunks within, and I happily dug into the extra lightly dressed leaves on the side. Much of the menu relies on similar items made elsewhere (bacon, sausages, pies) - ordering the tofu scramble or the pancakes might give a better impression of what the Banana Lounge's chef is really capable of. I'd go back and give 'em a go, though I might leave the big breakfast (at a mega $19.50) for Michael to review next time he's in the sunshine state. The Banana Lounge has received a positive review on The Bird's Blog but isn't quite what Getting Planted is looking for. Accessibility: Tables are reasonably spaced, most at footpath level with a ramp up to the counter and interior dining. I placed my order and paid at a medium-height counter, then food and drinks were served at the table. I didn't visit the toilets. It's been two and a half years since we last wrote about Yong Green Food. We've stopped by often in the interim, happily witnessing it go from strength to strength, doubling its dining space last year and collecting numerous rave reviews from veg*ns and omnivores alike (see list below). The menu's held fairly constant for a while but it's so lengthy and varied that it's yet to bore us. More than 90% of dishes are vegan and at least 50% are gluten-free, all clearly marked as such. Yong offer lots of non-alcoholic drinks - they're house-made and the prices show it, peaking at $9.50 for a large smoothie. I've given in several times this summer and splurged on the watermelon crush ($7.50). We rarely delve into the raw menu, although it attracts and excites many other diners. At $8.50-14.50 the snacks can seem steep, but I always consider ordering the tofu pocket platter (now $9.50). I've never tried the salads or noodles, though I still think the burgers and wraps are good value at around $10. Still, I most often find myself landing on the mains ($15-18.50). The bottom third of the page has a nice range of mock meat preparations served with brown rice and steamed (but cold) vegetables. These plates are filling but not heavy, and pleasingly balanced. The grilled king fish ($15, pictured above) might look a little processed but it has soft, flaky soy 'flesh' beneath the nori 'skin' and comes with a lovely miso gravy. Most recently Michael checked out the Korean BBQ ($16.50), another dish where mock meat is balanced with brown rice and lots of veges. The bonus kimchi will likely earn this re-order status. Yong is deservedly very popular. It can be noisy and only moderately well lit. We've found that the staff often look hurried, but they are always friendly. We were pleasantly surprised at how quickly these meals arrived after ordering. It's wonderful to see Yong really hitting its stride, delivering consistent high-quality food that satisfies all manner of Fitzroy diners. We've already covered Yong one, two, three, four times. Since that last post Yong has received near-unanimous accolades from veg*n (veganopoulous [one, two], I Am Woman, Hear Me Raw, melbourne with the rocket, easy as vegan pie [one, two, three], Vegie Mix, vegawesome!, Louise, by Degrees, In The Mood For Noodles, Ballroom Blintz, Learning to Raw, words@random) and omni (Suburban Culinary Adventures, Gastrology, Nikki Marie - Gluten Free, Naturopathic Eats, my mini manifesto, The tiny gastronomer, CAN LIFE GO ON WITHOUT BLOGS?, mochii eats, MEL: HOT OR NOT, I'm So Hungree, the indolent cook) blogs alike. Accessibility: Yong has a ramp in entry but the passage becomes narrow (it's noted on melbourne with the rocket that Yong is kid-friendly but not pram-friendly). The interior can be very loud. We ordered at our table and paid at a high counter. We didn't visit the toilets. We've been pub-clubbing around the inner-north for bloody ages now and have started to struggle to find new places to visit, lazily settling on a cycle of Fox/Tramway/Gasometer. I was determined to extend out list (currently at 33) and figured we should give the Terminus a shot. I'd been put off in the past by their focus on steak and other meaty treats, but their website made it clear that they had plenty to offer vegos as well (vegans will find things a bit trickier, but can probably cobble together something from the sides, starters and salads). The pub itself is quite pleasant - there's a few big outdoor tables, a dark and fairly relaxed front bar and, apparently, a more formal dining room somewhere out the back. They're also in the midst of some renovations, promising another bar area and a beer garden in the not-too-distant future. We settled in and happily sampled from their excellent range of tap beers while sizing up our menu options. There are a couple of mains to choose from, along with heaps of starters and sides. We decided to sample things from across the menu, starting with the obligatory fries and sauce ($6.90). Is there anything better than chips and beer? It's hard to imagine. We kept the fried-vibe going with the cheddar and oregano croquettes with mojo picon ($9.90). These were beautifully crisp little cheese pockets with gooey and delicious centres for soaking up the sweet and slightly spicy sauce. Our final small dish was the most interesting (and most likely to be vegan): betel leaves with crispy tofu, coconut, chilli, green papaya salad ($13.90). This was terrific - the tofu was lightly battered (almost tempura-style), and the papaya salad was spicy, sweet and sour in exactly the right combination. To cap things off we split a kale bisteeya (a pastry cylinder stuffed with kale, fetta, almonds, served with sumac and tahini yoghurt and a chickpea salad, $24.90), one of the two veggie mains (the other being a goats cheese tortellini). This takes the standard vegetarian option of a spinach and cheese pastry and kicks it up several notches - the pastry itself was perfect, and the filling rich and tasty. The accompanying salad was excellent too, acting as more than just a plate-filler. It was fantastic to discover the impressive array of vegetarian food on offer at The Terminus (we also sampled the broccoli, farro, almond and caper salad, which was superb) and to realise that it's not quite the stuffy foodie pub I was imagining, although the food is a little on the pricey side. They did a solid trade, with a mix of families and small groups like ours, but the food all came out quickly and we enjoyed the laidback Sunday evening vibe. The Terminus is well worth a visit - we'll be pub-clubbing there again before too long. The Terminus is pretty well-liked, with FoodsCrazy, Up Here in Cazaly, The Tasty Dozen, Gastrology, Where Adles Eats, eat, drink, stagger and Parma Daze all enjoying their visits, while juganaut's foodie thoughts wasn't overly impressed. Accessibility: There's a couple of small steps as you enter the front bar, which has a reasonably spread out mix of high and regular tables. Ordering and payment happens at the front bar. We didn't visit the toilets. One of our favourite companions to a Vietnamese meal is Vietnamese-style iced coffee. So after we'd picked out bánh xèo I swapped Plenty for David Lebovitz's The Perfect Scoop, which I knew contained a recipe for Vietnamese coffee ice cream. I didn't end up following Lebovitz's recipe too closely - if you track it down you'll see that I omitted the pinch of ground coffee and the awfully American half-and-half. And since I had the supplies on hand, I went vegan with soy condensed milk instead of using the usual dairy stuff. This ice cream has the signature bittersweetness of the drink and ended up with some of the iciness too - unfortunately I couldn't coax it to whip up properly in my icecream maker. It was quite scoopable and very edible regardless. Whisk together the ingredients in a bowl. Refrigerate them until thoroughly chilled, then churn in an icecream maker according to the manufacturer's instructions. Last Saturday was my favourite kind, spent cycling around sunny Brunswick eating delicious things, picking up some groceries and returning home to cook together and kill some zombies. Inspired by our recent visit to Fina's, we tried our hand at bánh xèo. There are recipes all over the internet for these rice flour pancakes but we wanted to start with Ottolenghi's version, even faithfully shopping around for the precise herbs and vegetables in his filling. The filling is really about patiently shredding and picking a whole lot of fresh veg. Mint is a must and I really liked the daikon, but you could otherwise mix up the greenery to suit yourself. The sauce is a sweet and spicy delight, faintly recalling fish sauce but not all-out mimicking it. The pancake, I typically find, is the tricky part. (As an aside, I was surprised to see egg in this one as I think the restaurant versions I've eaten have been vegan.) No two of mine were quite the same, and I panicked over every flip. I think the aim with this recipe is to use medium, rather than high, heat. You want the batter to sizzle a little as it hits the pan, but then spread out smoothly and take a while to really set through before the high-stakes flipping. I preferred the pancakes that were a solid 2-3mm thick over the more crepe-y ones, they really soaked up the sauce. Bánh xèo is a lovely summer meal, and we're having just the lovely extended summer to enjoy it in. While we chose this as a bit of a project, there's potential here to pare things back to a simple lunch - a rice flour/coconut milk batter, whatever greens are around, kecap manis, chilli and perhaps a little vinegar would just about do it. Start with the filling. Peel then shred the carrot and daikon - Michael did this all with the vegetable peeler. Slice the spring onions. Slice the chilli and snow peas into long, thin strips. Pick the herb leaves. Set it all aside, with the sprouts and mushrooms too. Whisk together all the sauce ingredients. Place the rice flour, egg, salt and turmeric in a large bowl. Whisk in that egg slowly, gradually pouring in the coconut milk as you go. Keep whisking until you have a smooth batter. Splash the sunflower oil into a non-stick frypan and bring it to medium heat. Slowly pour a quarter of the batter into the pan, allowing it to spread out into a large circle. Cook the pancake for 3-5 minutes, until it's browning a little underneath and set on top. Gently flip it over to brown the other side. Slide the pancake onto a plate. Arrange a quarter of the filling ingredients over half of it, spoon over a tablespoon or two of the sauce, fold over the pancake into a semi circle and spoon over more sauce. Repeat with the remaining ingredients to make four pancakes. Brian recently tweeted the news that changes were afoot at local favourite L'Atelier de Monsieur Truffe, with a name change to East Elevation and some sort of rejiggery. Cindy scanned the new menu online, noting loads of similarities to the old menu and an added dose of vegan-friendliness, so we headed on over to investigate. Aside from the name, it doesn't appear too different: same unmarked red door on entrance, same wonderful high-ceilinged interior, same charming staff. The selection of Msr Truffe goodies for sale has shrunk slightly, but there's still a pretty full range on offer (we left with a couple of dark chocolate blocks tucked into our backpack). We got the rundown from the staff about the recent changes - it turns out that Thibault Fregoni has sold the Truffe brand and headed off overseas, leaving Jade in charge of the chocolate-making and with new management running the cafes. The cafe's name-change was as much to signal these underlying changes as anything else - the same kitchen staff are running things and most of the front-of-house staff were familiar to us from previous visits. Even the menu isn't that different - a few dishes are exactly the same, and the general vibe is pretty similar. What seems to be new is a focus on offering a range of vegan-friendly dishes - there are four dishes that are vegan by default, plus a handful of others that can be adapted. They're also pretty clear with the gluten-free labelling, although they don't seem to offer gf toast. We decided to see how they fared for restricted diets, both ordering vegan and gluten-free dishes. Cindy ordered the organic coconut and lime tapioca with fresh mango, passionfruit, strawberry and nut crumble ($12). At $12 this was a whole lot more interesting than my $14 summer porridge at Marmalade and Soul; the tapioca was sweet and citrussy, with the poured over coconut milk adding some moisture. The fresh fruit was excellent and, although Cindy wasn't mad about the use of hazelnuts, it was a pretty impressive dish. I went savoury, skipping over some delicious-sounding egg dishes as well as a vegan eggplant and mango noodle salad before settling on the chipotle-braised tempeh with mint, zucchini ribbons, coconut and cauliflower puree, oranges, hazelnuts and watercress ($17). This was spectacular - the spicy tempeh and amazingly creamy cauliflower puree combining with the freshness of the greens and my new favourite way to eat zucchini. The oranges and nuts kept things varied and interesting, and the whole meal just impressed me with its imagination and execution. Admittedly I'm kind of a sucker for anyone who'll serve me tempeh but this really, really hit the mark. A few more things remain unchanged at East Elevation: they have the same impressive selection of pastries and sweets up at the counter and they take their hot chocolate very, very seriously. We had some time to kill, so we decided we'd better see if their standards had slipped. Cindy's single origin hot chocolate was ridiculously rich and gloopy - really just like drinking melted chocolate. Which is no bad thing at all. Our sweets (a passionfruit yo-yo for Cindy and a pain au chocolat for me) were top notch as well - the pain au chocolat was a bit less brown, crunchy and flaky than I remember from previous trips, but the dark chocolate was as good as ever. Reassuringly, East Elevation hasn't strayed far at all from their L'atelier de Monsieur Truffe roots - the food is still excellent, the atmosphere cool and relaxing and the chocolates and sweets as fantastic as ever. It's brilliant that they have such a great range of vegetarian and vegan meals as well - they're really doing their best to compete with places like Wide Open Road - hopefully it goes well for them. Read about our previous visits to L'atelier de Monsieur Truffe here, here and here. I'm not sure anyone has reviewed East Elevation yet (it's unclear which iteration of this place this Hey Bambini post relates to). Accessibility: Excellent. A ramp on entry, great light, lots of space and a dedicated disabled toilet. Ordering happens at the table and payment at a reasonably low counter. This blog has been pretty heavy on the restaurant posts lately, reflecting our lack of home cooking enthusiasm over the last few months (in part thanks to trips away to Sydney and Hobart). With a couple quiet weeks in a row we've been trying to get back into the swing of things, and this simple burger recipe from the tropical vegan was a pretty good to recapture my cooking mojo. There's not a lot to it - especially if you take the lazy option of using canned beans like we did - but the results are excellent. The patties hold their shape well and are hearty and filling with nice subtle flavours from the lemon and sage. We didn't have the energy for the roasted eggplant sauce that Theresa whipped up, so Cindy recreated the dipping sauce from the previous night's rice paper rolls, which was a fine substitute. We ended up getting three meals out of these patties and I really enjoyed them every time - something to add to our regular burger rotation. Combine the beans, olive oil, lemon juice and sage in a big bowl and leave them to soak together for as long as you can be bothered (I only read the recipe once I was hungry, so they only marinated for 10 minutes or so). Mash the beans up as best you can - you want to have a fairly smooth mush without too many distinct beany bits remaining. Stir in the polenta and generous sprinkles of salt and pepper. Add in the gluten flour and knead the dough for a few minutes - it should be a pretty solid dough by the time you're done. Form the mixture into patties (we ended up with 6 good-sized burger patties from the quantities above) and then fry over medium heat for 5 minutes or so on each side. Serve in rolls, with salad and the condiment of your choosing. Next Saturday, the Melbourne Bikefest is holding a Village Picnic at the Abbotsford Convent. There'll be bikes to check out, mechanics to check out yours, food and music and art and film. We'd particularly like to draw your attention to the Summer Bake-off, because we'll be on the judging panel! 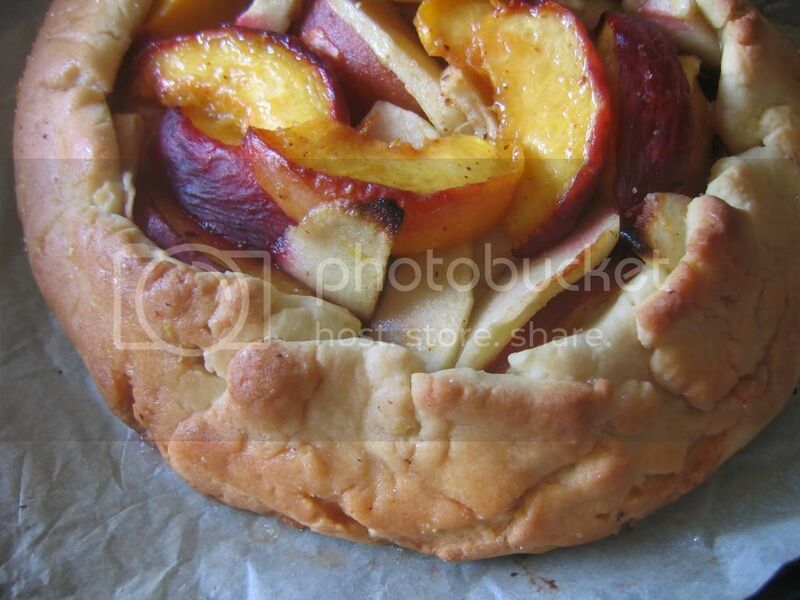 This year's theme is stone fruits and it's the perfect time to bid adieu and pay tribute to your summer favourites. We'd also love to see some vegan-friendly and gluten-free entries. Entries will be accepted March 9 from 11am - 1pm with judging from 1:30pm and winners announced at 2pm. Once us judges have had our taste, everyone's free to sample the goods! You can also join the facebook page for more details, including registration. We hope to see you and your best baked goods there! The terrific rice paper wraps I ate at Vina in Sydney inspired me to pull out a spring roll recipe from My New Roots that I'd bookmarked a while ago. It really smashed through our vege box, clearing two carrots and a sweet potato as written and allowing us to sneak in zucchini and corn as well. The carrots and sweet potato are chopped into matchsticks and lightly sauteed in garlic, ginger and agave nectar, then showered with sesame seeds. This was sufficiently punchy to work in the zucchini and corn without any extra seasoning. Sarah bases her dipping sauce around almond butter but we had better luck locating cashew butter and no regrets. With these wraps being so fresh, they were impossible to dip into the cashew sauce with dropping half their contents into the sauce dish. I tried wrapping the sauce into the rolls (pictured above), but actually preferred spooning the sauce directly onto each mouthful as I ate. The recipe below recounts what I used this time around, but the fillings and sauce are both highly suited to adaptation based on personal taste and what's on hand. Gently toast the sesame seeds in a frypan, then set them aside. Julienne the sweet potato, carrots and zucchini; shuck the kernels from the corn. Heat a little oil in a frypan. Add the ginger, garlic and agave sauteing for a couple of minutes. Stir in the sweet potato and carrot, coating them in the flavour mix. Cook, stirring, for 3-5 minutes until the vegetables are heated through and no more than a bit wilted. Take the pan off the heat and sprinkle over the sesame seeds and lemon juice. Set the pan aside. Whisk together all of the dipping sauce ingredients, adding more water to thin the sauce out if needed. Fill a separate frypan with water and heat it until the water bubbles. Turn the heat off. Take a rice paper wrapper and dip it in the water, rotating it around until all of it has been submerged and softened, then place it on a plate. Arrange a thick line of the carrots and sweet potatoes, then a few zucchini matchsticks and a trail of corn kernels down the centre of the wrap. Fold in the short sides, then roll the long side through (if you haven't done this before, there are some helpful photos on My New Roots). Repeat with the remaining wrappers and filling, or have everyone make their own at the table. Spoon the cashew sauce generously over the rolls. 06/04/2013: We just saw in this comment that Marmalade & Soul is 'closed until further notice'. You might want to call ahead before attempting to visit. 08/04/2013: Further evidence on fitzroyalty. I've been wanting to visit Marmalade & Soul since I saw house-made poptarts on their breakfast menu. We've been slow about it and they're no longer offering those poptarts, but they've still got a clear predilection for the sweet stuff. The current breakfast menu boasts a breakfast trifle, banana split (of sorts) and French toast, plus fruit salad, summer porridge and pancakes on the specials board. I was overwhelmed! There's a bunch of savoury stuff too, but it's pretty meaty - the one exception is whipped egg served with portobello mushroom, ricotta and gremolata ($16). I was surprised to see Michael pass over it and submit to sweet, ordering the 'summer porridge' ($14), actually a chia pudding with fruit, nuts and hung yoghurt. In turn, staff were kind enough to serve it banana-less on Michael's request. Though chia seeds are a novelty for us, Michael's main comment was that this was small, and I think he demolished it in just five or six spoonfuls. Meanwhile, I was discovering why they list 'banana split' ($14) in quotes. Not only does it lack icecream (fine by me at breakfast), the banana isn't even split! It is beautifully caramelised, with more sweet dark butter pooled underneath it, and it's served with piped globs of peanut butter custard and creme fraiche, shaved walnuts and mint leaves. The mint really didn't work for me here but was easily set aside, otherwise it was a lovely dessert. For me, it was too small and too rich for breakfast, especially at that price. The meaty savoury breakfasts looked much heartier, though they haven't always been positively reviewed on other blogs. Many dishes (including the savoury veg one) are unusually toastless, which didn't fuss me too much, until I noticed that toast and other optional extras incur a $5 charge each on top of a $14-17 breakfast! That well exceeds my willingness-to-pay at breakfast. While Marmalade & Soul's approach to breakfast doesn't seem to suit us, I'd go back to splurge on afternoon tea - they project a special affinity with sweets and my dish was certainly well executed. We liked the atmosphere - it's spacious and seems accessible and the staff were attentive, while the interior design teams bare walls and simple furniture with vintage baking fripperies. There must be some way we can get along! Marmalade and Soul has had a mixed reception! Most positive are The Glutton and the Lush, GastronoMel, Melbourne Mum, off the spork, where food is (twice), Lot of Cravings and I'm So Hungree; feelings are more conflicted on MEL: HOT OR NOT, two munch, dining nirvana, Melbourne Dining Experiences, fitzroyalty, LAURENBRUCE and Oysters & Oxtail. Accessibility: There's a small step at the door, then a spacious interior of mostly standard-height tables then a high bench or two. Toilets are unisex and include one marked for disability access. We ordered at our table and paid near the door on our way out.